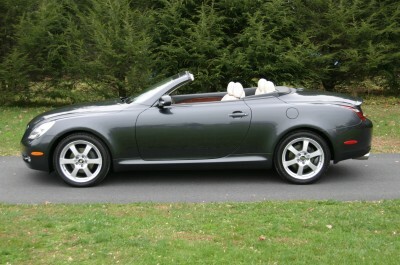 The 2006 Lexus SC 430 counters with a serene top-down experience. 2006 marked the fifth year, of the SC 430 being the first and only Lexus convertible. On the inside, the Lexus SC 430 presents a glorious display of perfectly crafted wood trim, supple leather and all the high-tech features you would expect in a high-end luxury vehicle. The Mark Levinson audio system, in particular, is a delight. For top-down motoring, the SC’s power-operated hard top can be quietly lowered in about 21 seconds and is perfectly airtight when raised. The 4.3-liter V8 allows the Lexus SC 430 to leap from nearly any speed. It climbs to redline with no discernible strain. This convertible has a long list of comfort and convenience features, beautifully finished interior, retractable hardtop, Lexus quality!